On July 6 the Israel lobby group Centre for Israel and Jewish Affairs (CIJA) met with Justin Trudeau. 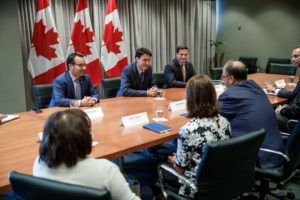 The group, whose mandate includes lobbying for “positive improvements in Canada’s policy toward Israel,” expressed their “profound concern” about Prime Minister Trudeau’s tepid statement following the shooting of Canadian emergency room doctor Tarek Loubani. Loubani was providing medical assistance to Palestinians who were protesting Israel’s continued military occupation and illegal seizure of Palestinian land. Between March 30 and July 12, 2018, 146 Palestinians were killed and more than 15,000 wounded by Israel military forces. Among the victims were peaceful protesters, children, journalists and medical personnel. Even people running away from the sniper fire were shot and killed from behind. No Israeli citizens or military personnel were seriously harmed by Palestinian protesters. Independent Jewish Voices reminds the federal government that the opinions of CIJA are not shared by all Jewish Canadians. We remain in solidarity with Palestinians, whose right to protest and assembly is under increasing attack.